Take Highway 836 West from the Miami Airport to the Florida Turnpike–South. Stay on turnpike for 23 miles until it dead ends and merges into Highway US#1 in Florida City. In Florida City, take US# 1 south for 68 miles. We are located at mile marker 68.5 in the City of Layton on Long Key. Take Highway 836 west from I-95 to the Florida Turnpike-South. Stay on turnpike for 23 miles until it dead ends and merges into Highway US#1 in Florida City. In Florida City, take US# 1 south for 68 miles. 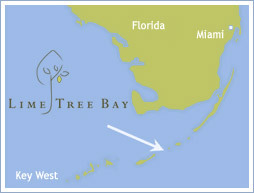 We are located at mile marker 68.5 in the City of Layton on Long Key.